Today's bombing will change the Boston Marathon forever—that, in and of itself, is a tragedy. The dead. The injured. The anguish. All the result of bombs that were set to explode at the finish line just over four hours after the start of the Boston Marathon. Right now the sane among us will suggest caution. We’ll suggest restraint. We’ll suggest the giving of blood. There will be time to mourn. We will mourn the dead and injured. I also mourn the Boston Marathon and how it’s now been brutally disfigured. For me and to any serious marathoner the Boston Marathon will always be the runner’s Holy Grail. Runners train and train and train for this race. If you qualify for the marathon you get the honor of running through all the beautiful outlying towns, you get to temporarily lose your hearing as you run by what seems to be thousands of deafening screaming women at Wellesley, you climb Heartbreak Hill, you run by all the college parties, you pass the CITGO sign and know you have one mile left, and finally when you make the final turn, you sprint by thousands of cheering people towards the finish line. Nothing is like it. Nothing. I just can’t imagine this. What is the most joyous occasion has turned into a tragedy of epic proportions. Like a scar across someone’s face, the bombing will now be a part of the Boston Marathon, but also like a scar, we have to remember it’s only a part. 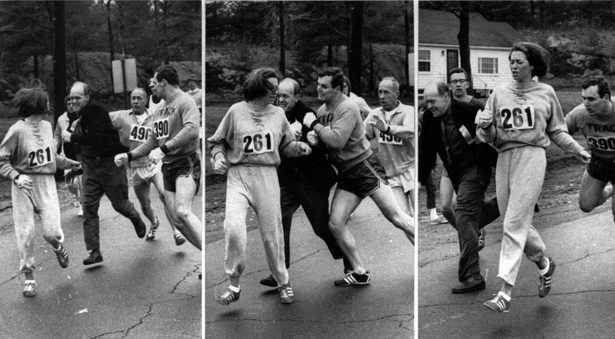 If this bombing will always be a part of the Boston Marathon, then so is Kathrine Switzer. I want to tell the story of Kathrine Switzer because it’s about remembering the Boston Marathon as something more than the scene of a national tragedy. In 1967, the Boston Marathon gave us all a glimpse of the possible. Today we saw not of the world we’d aspire to live in, but the one we actually inhabit. Instead of the triumph of the individual amidst the powerful throngs and inspiration of the collective, we have tragedy, disarray, panic, and fear. Like a scar, it now marks us: the loss of security among the mass. But like a scar, we may need to wear it proudly. We will run next year because the alternative is too awful to contemplate.